The Chakras are an ideal roadmap for personal growth and development. In 2017 we started our journey through the Chakras and focused on one energy center a month. We are going to keep on going in 2018! On our monthly adventure, I am going to educate you about a specific Chakra or a Chakra concept and then ask you to contemplate its function and roll in your own personal growth. This month, we are going to focus on Chakra Psychology; specifically, the Chakra Hierarchy of Needs. Brief Overview of the Chakras: Our subtle energy bodies are made up of numerous energy channels that all together form a matrix. These channels flow through and around the body like highways of energy. These flows of energy are known as nadis in the Vedic tradition and meridians in the Chinese Medicine tradition. Where these flows of energy crisscross and intersect is where the chakras are formed. The Chakras are energy centers and vortexes in our subtle body. Seven large energy channels crisscross to form the major chakras (Root to Crown). These large energy channels are the flow of manifestation, liberation, expression, reception, ida, pingala, and sushumna. Minor chakras form where the lesser nadis cross. As there are many nadis, so there are many minor chakras. The Chakras are openings for life energy to flow into and out of our aura or electromagnetic field. There are main Chakras, minor, subpersonal, and transpersonal Chakras. The Chakras’ function is to vitalize the physical body and to bring about the development of our self-consciousness. Each Chakra is associated with certain physical, mental, emotional, and spiritual interactions. Each Chakra has personal growth themes, functions, and purposes. How do the Chakra get unbalanced in the first place? When we are stressed, ill, experiencing disease or imbalance, not satisfied with our life, or not reaching our full potential, our chakras may become unbalanced, energy may be stuck, you may have stagnant energy, or not have adequate energy flowing through the Chakras. How does this happen? Trauma, life experiences, karma, cultural expectations, beliefs, ideas, emotions, actions, and maladaptive patterns can disturb and distort energy flow. In order to heal, we need to release blocked energy (emotions, old patterns, maladaptive beliefs). We also need to be aware of our beliefs and thinking and modify them in order to keep energy flowing freely. Sure, you can use crystals, yoga, Reiki, aromatherapy, sound, etc to clear energy and balance your chakras, but if you don’t address the underlying maladaptive thoughts, beliefs, and behaviors contributing to your imbalance you will never get to the root of your problem and heal. Chakra Hierarchy of Needs: Chakra Psychology uses the Chakra system as a model of human development and consciousness evolution. Psychology is the study of the human psyche; our mind, soul, emotions, behavior, attitudes, and cognitions. Psychologist Abraham Maslow stated that human motivation is based on people seeking fulfillment and change through personal growth. In order to evolve our consciousness, we have certain needs that must be met. In order to truly heal and meet these needs, we need to change the way we think, act, and behave. The needs are a pyramid. 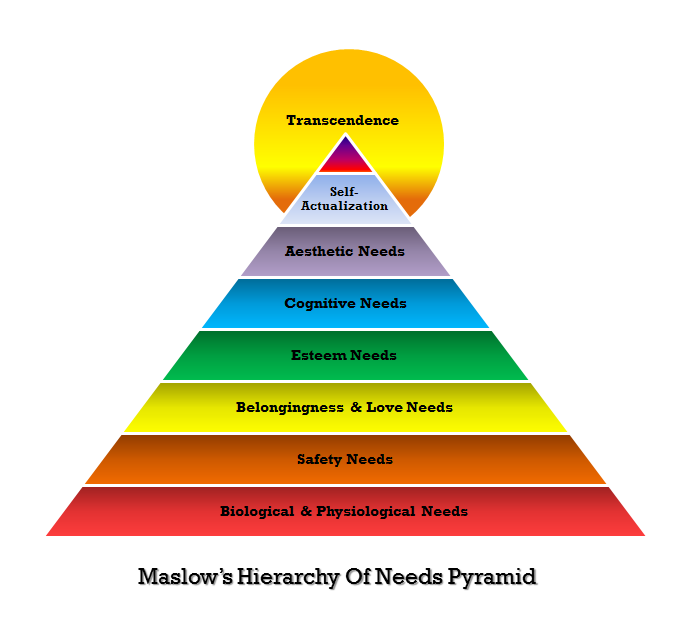 The bottom of the pyramid is the largest as these needs are the most important for our survival. As you move up the pyramid, the needs become more about emotional health, then personal growth and then spiritual development. The lower level needs must be satisfied before higher-order needs can influence behavior. If the lower level needs haven’t been met, a person must satisfy those needs before trying to satisfy higher level needs. Once the lower level needs have been satisfied, a person can then focus their behavior on the needs of the next level. Once each level’s needs are met, then the next level becomes important. When you encounter an emotional or behavior issue, identify which chakra or level of the pyramid the concerns is in and then try to find out if there are needs in the lower chakras below the chakra(s) of concern that are not being met, and take steps to meet them if possible. Solar Plexus Chakra Consciousness – Energy, ego, power, personality, will, risk, motivation, determination, and action. Higher Heart Chakra Consciousness: Unconditional love for all of humanity, healing the world around you, increasing the vibration of humanity, practicing the lessons of the heart, serving, donating, volunteering, giving back to your community in some way, generosity, altruism, and humanitarian work. Throat Chakra Consciousness: Communication, self-expression, being heard, being validated, integrity. Third Eye Chakra – Needs that Must Be Met: Ability to dream and have goals and aspirations, realizing personal potential, ability to see the whole picture and have insight, ability to find meaning, personal growth and peak experiences. June 2018 Chakra Contemplation and Suggestions: Identify the key/core issue you are healing or attempting to heal in your life right now. Then determine what Chakra holds that consciousness. When you encounter an emotional or behavioral issue, identify which chakra or level of the pyramid the concerns is in and then try to find out if there are lower level needs that are not being met, and take steps to meet them if possible. Determine if all your needs in that Chakra are met or if you have needs in lower chakras that must first be met. It’s important to note that our needs are constantly changing. As one need is met, we desire other needs. So we can move back through the chakras more than once. About: Christina Wilke-Burbach PhD, RMT, CA is a Spiritual Counselor, Holistic Health Consultant, Certified Aromatherapist, Herbalist, Master Gardener, Docent, and Reiki Master Teacher with a PhD in Health Psychology. Her business, Mind, Soul, and Self LLC is based out of Wisconsin. For more info on Dr. Christina and her upcoming Chakra Retreats, Chakra Classes, Chakra Bootcamps, or to schedule an individual reading or appointment, please visit mindsoulandself.com. Many Blessings and Be Well!